作者: Rahul Aijaz on 24 March , 2015. “I am the fuel-breathin’, smoke-emittin’, metal and glass-work wearin’ (Woo! ), art drippin’, trail blazin’, road thumpin’ son of a truck!” Well, that’s what a Pakistani truck would say (if it could speak). Ric Flair style. Woo! The Transformer-like monstrosities dominate the roads in Pakistan. But the gigantic man-made creatures have been turned into moving canvases of art, appealing to locals and foreigners alike, thanks to the underrated hardworking artists, who spend years honing their craft and decorating the trucks. Truck artist Haider Ali has risen to represent Pakistani truck art internationally. Ali dreams of using truck art as a way to create bridges between countries and change the image of Pakistan all over the world. During the long conversation, Ali explained the history, evolution and aesthetics of truck art in Pakistan. One question that kept bugging me for quite some time was: “Why paint trucks?” Ali responded with an interesting lesson of history. He said, “Man has been painting and decorating everything from the beginning of civilization; he likes to express himself. In the modern world, we do it through trucks. Before the invention of trucks, when animals like camels were the means of transportation, we used to decorate them too.” Interestingly, even today, you can find camels decorated with mirror work and traditional fabric on the beach in Karachi. 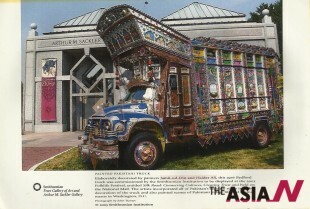 Ali painted a truck in the Smithsonian Institute in 2002, which still stands to this day. Looking at the gigantic structure of the truck, one cannot help but contemplate about the specific elements used in the intricate design. What caught my attention was the repetitive use of flowers and eyes. Ali talked about flowers being used for decorative purposes whereas eyes serve multiple purposes. First, eyes help protect from bad omens. Second, while driving at night, it is a reminder for drivers to be alert about trucks ahead. Reflector tape is also used in the posterior part of the trucks to reflect the light and keep blindly racing drivers aware. Yes, drivers do compete. And they like to have fun doing so. This is where poetry painted on trucks comes in handy. Verses and phrases like “Dekh magar pyar se” (loosely translated as “look at me lovingly”) and “fasla rakhen warna pyar hojaega” (keep distance or we’ll fall in love) are painted on the back of trucks to tease other drivers. 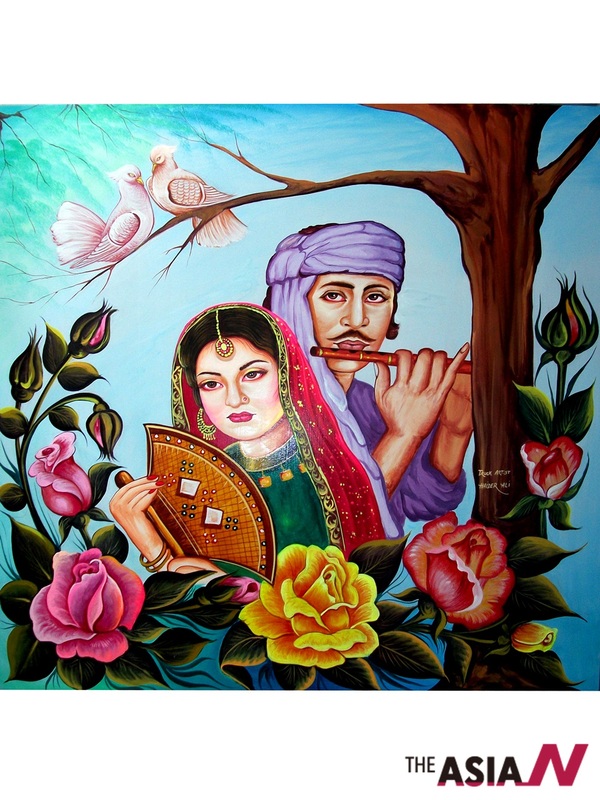 Another beautiful part of truck art is the depiction of Pakistani folk tales and regional rural lifestyle. Usually, as Ali explained, an owner of a truck wants the popular Punjabi folk tales of Heer Ranjha and Laila Majnu on his truck. Ali commented that owners only demanded Laila’s painting nowadays, as she is the symbol of love. It may as well be an expression for heartbroken truck drivers. Moreover, truck owners also demand depiction of scenes from their ancestral village or sometimes a painting of their favorite celebrities they have sighted in posters or movies. It also must be noted that truck art is not just painting, but includes numerous other crafts as well like mirror and steel work, camel ornaments, etc. And truck art is not only limited to trucks. Haider Ali said he had been painting trucks for 28 years. He started out when he was seven and was mesmerized by the large number of foreigners coming and taking photographs of what would later be known as “truck art.” He said, “I was surprised and at first, did not know what was special. My father and whole family has been involved in the truck art business, but the reason I wanted to pursue it was because I found people showing interest and pleasure in what I painted.” It was like performance art; people’s interest in his performance encouraged the artist. Ali has travelled to and painted in seven countries including the U.S., U.K., Turkey and India. He narrated the experience of his first exhibition at the Sheraton Hotel in Karachi, Pakistan. He said when it was his turn, almost everyone had left. The biggest surprise was the 9/11 incident, which occurred during the exhibition. Initially shocked and disappointed, he was later approached by Dr. Jonathan Mark Kenoyer, professor at University of Wisconsin, who invited him to the U.S. to talk about his art. That was Ali’s break into showcasing his art to a wider audience, as he was invited to exhibit his art at Smithsonian Institute in Washington, D.C., the next year. What is interesting is that in Pakistan, trucks are more functional whereas internationally, they are recognized as art. In Pakistan, people view it as decoration for attracting more customers. 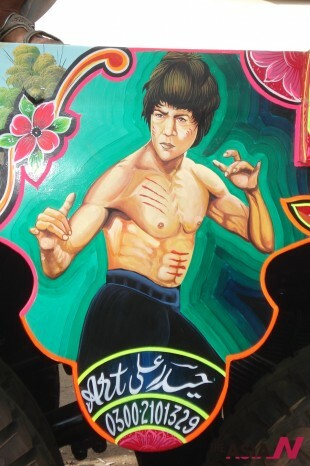 As Ali explained, attracting more customers was and is still the purpose of truck art. Although, it has become more competitive now than it was in the beginning, in the 1960s. Truck owners want their vehicles to be the best painted on the road. They spend millions of Pakistani rupees on each truck. Yes, each truck takes around two to four months to be painted and costs half a million to around two million rupees, which is a staggering amount considering the average income in Pakistan is far less than that. What is more surprising is that there is not even any support from the government. It is all privately owned. 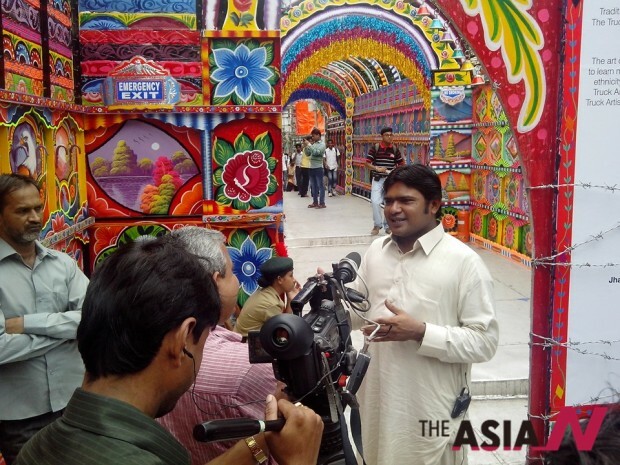 “I believe truck art could be the bridge between Pakistan and other countries. I use truck art to spread friendship between Pakistan and other countries. To let people know we are not extremists,” added Ali. He also believes that truck art could be used in other countries to increase employment. Recently, he founded his own company, Phool Patti, through which he hopes to make truck art more popular internationally and teach foreigners about it. He wants people from around the world to come to Pakistan and learn truck art and spread it in their countries. Ali said, “The word ‘truck art’ is given to us by foreigners because we paint trucks. Do you know what we call it in Urdu? Not many people know about it outside of the truck art industry. We call it ‘Phool patti.’” “Phool patti” literally means flowers and leaves. Why dozens of Pakistani peacocks perish?